Behold. The kitchen peg board. I’ve been interested in mounting a peg board in the kitchen for a while (my Reader archive, soon to go up in smoke, tells me I started bookmarking them in 2009). As with most projects, my motivation came from a problem I was aiming to solve. We have only 3 drawers in our kitchen: 1 for silverware, 1 for towels, and 1 for gadgets ranging from apple corers to zesters and every letter in between. Beyond the drawers, we employ two crocks (1 for wooden spoons and the other for whisks, spatulae, and serving implements), one GRUNDTAL rail, and a knife magnet for the sharps. The drawers were getting full and the crocks were crowded. A solution came in the form of an abandoned peg board stranded at the back door where I work. All it needed was a bright coat of paint. Paint choices were many. Green won out. Something that I re-learned from this process is what a difference drying time makes for paint. When you open the can, don’t freak out. When those first strokes go up (or down as in this case), don’t freak out. Keep going. Now wait for it to dry. See? Everything’s going to be fine. If you’re curious about how to mount a peg board, there are plenty of good to excellent tutorials floating around the web. Wanting to keep the project as close to free as possible, I used garden stakes with the points trimmed off (a brilliantly simple idea from my father) for the frame and painted them white to match the wall color. In the end, the project came in at under $20 including the stakes, paint, and hooks, which accounted for about half of that. And yes, I use very cheap paint. Sometimes I wonder if the peg board adds too much visual clutter to the kitchen when I look back at pictures taken before it went up, but the convenience of having all of these bits and bobs so easily at hand outweighs my worries. This entry was posted by Martha on Friday, March 15th, 2013 at 9:45 am and is filed under Apartment. You can subscribe to responses to this entry via RSS. Love the solution! The green is really cheery for that corner without being loud! 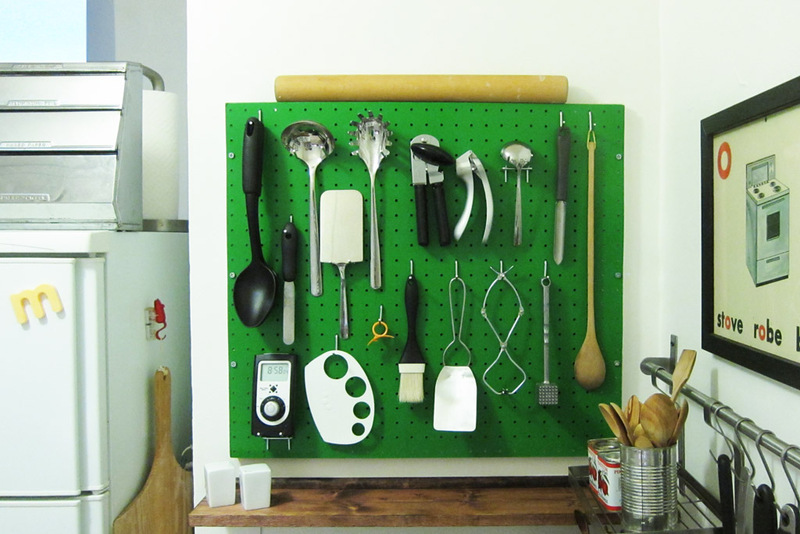 I looooove the pegboard. Outstanding. Beauty is simple. The best things are free, well, sometimes almost free. 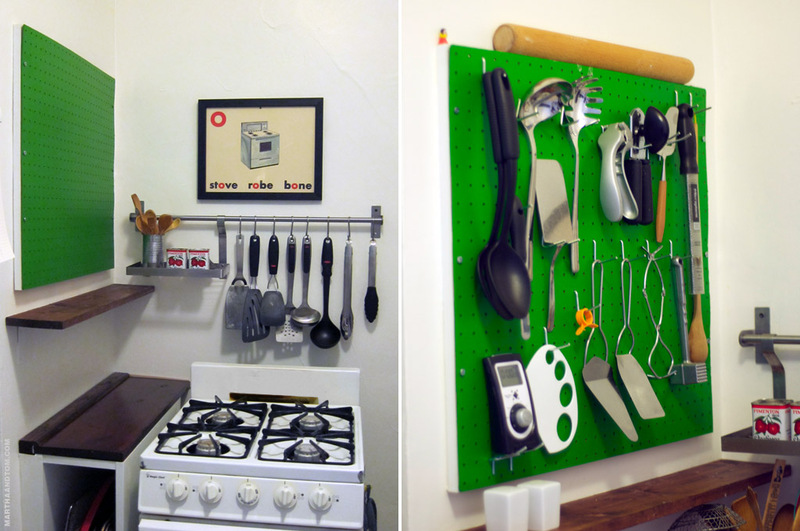 That green board changes the kitchen into a new space.